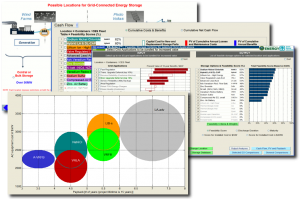 The ES-Select™ Tool aims to improve the understanding of different electrical energy storage technologies and their feasibility for intended applications in a simple, visually comparative form. It treats the uncertainties in technical and financial parameters as statistical distributions. ES-Select™ was created by DNV-KEMA in collaboration with Sandia National Laboratories, and is licensed for public use. The “ES-Select™: A Decision Support Tool” factsheet (PDF, 1.4 MB) provides additional information. Presently, ES-Select™ is only supported on Windows (XP or newer). Mac support is currently not available. First-time users need to download ES-Select™ and its supporting library (EXE, 181 MB). Once ES-Select™ is installed, the update installer then should be downloaded and run. If an earlier version of ES-Select is installed already, only the latest ES-Select™ update installer is needed (April 30, 2013, version). The update adds gas turbines and demand response data to calculate payback comparisons as alternatives to energy storage. Calculation of the best storage “price” by balancing profit against market penetration. An option to export ES-Select data to Microsoft Excel. New scatter charts that show correlation between energy storage parameters. The second version of the ES-Select Storage Selection Tool developed by DNV-KEMA is now available for public use. The new version includes a number of enhancements in cash flow and payback analyses, as well as ease of use. Users are greeted with a newly structured homepage that simplifies the use process and identifies early on, feasible storage options for the user’s selected applications before the user may need to have a further dive into specifics. Besides the strengthened business analysis capabilities, ES-Select now offers more flexibility for the user to enter his or her own storage data and adjust other storage option parameters like costs that are subject to change as technology costs come down. An improved version of ES-Select’s energy storage feasibility scoring algorithm better identifies applicable storage options for the selected application. A new algorithm for bundling multiple grid applications helps a user understand the realizable potential and value for a storage system to serve multiple applications simultaneously. This algorithm is based on utilization factors that consider the application characteristics and its priority relative to other applications, as set by the user. These enhancements simplify the analysis process of bundled services and allow users who are unfamiliar with energy storage to evaluate a bundled business case. New updates will be released occasionally. Please visit this site for any updates. For other technical issues, please e-mail Raymond Byrne at Sandia. ES-Select™ enables users to select multiple applications and adjust their values based on their mutual compatibility. It then scores and ranks the feasibility of various storage technologies to serve the selected applications. It provides a graphical comparison of the selected storage resource’s technical and economic features. In the application’s initial screen, users choose from the five main locations for energy storage in a power grid, from central or bulk storage facilities with a capacity of 50 MW or more to residential and community storage of 100 kW or less. In the subsequent Select Main Application screen, users can select the main applications for their storage resource from a matrix that compares 10-year benefits in value per kilowatt, as well as potentials and required discharge durations. This same screen allows a user to adjust input parameters and set priorities for bundled applications. It also provides a feasibility score to rank storage technologies to meet the selected input parameters. This new version of ES-Select™ enables the user to view predefined and set custom bundling (multiple application) priorities in the Bundling Multiple Grid Applications screen. The tool comes with predefined bundling priorities based on actual data and modeled projections that ensure that the total bundled value is calculated properly. As additional applications are entered, ES-Select™ calculates their individual application values and uses their bundling utilization factors to identify their realizable values when used to serve bundled applications. With the applications selected, ES-Select™ calculates scores for different storage systems to serve the application (or applications) and location requirements, for their total installed costs, and for their commercial maturity. These scores are then aggregated into a total feasibility score to determine the optimal storage technology for the selected application (applications). The new version of the tool enables users to evaluate cash flow, cumulative costs and benefits, and net present values based on a distribution of costs and benefits. Multiple system parameters can be plotted, including energy density, specific energy, lifetime throughput energy, installation costs, annual expenses, total cost of ownership, and payback, for the different storage technologies selected. The resulting plots then compare the selected technologies based on the parameters selected as horizontal bar charts, correlation charts or as a statistical distribution.